The Web Marketing Association has partnered with major industry conferences for many years, and none longer than ClickZ Live. Educating marketers for over 15 years, ClickZ Live (formerly SES Conference & Expo) is the most cutting-edge, all-encompassing digital marketing event series in the world today. Join us August 10-12 as we return to San Francisco with our action-packed, educationally-focused agenda that will cover the latest digital marketing tips, tricks and tools that will blow your mind, make you rethink your strategy and provide actionable takeaways to revolutionize your marketing campaigns. The Web Marketing Association is offering two chances for you to improve your knowledge and understanding of web marketing. You can register to win either a free conference pass to a major industry leading event, or an insightful book written by the Editor-in-Chief of Website Magazine, or both! Deadline to enter is July 7th. Visit our drawing page to enter. eTail launched in 1999, and have been dedicated to supporting the growth of the retail industry ever since. What started off as 100 people in a room discussing where this sector is headed, has lead to 2000 senior-level eCommerce executives being inspired whilst learning and developing their company as well as their careers. Learn more here. 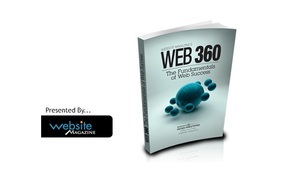 Win a free copy of the book “Web 360: The Fundamentals of Web Success” the first book to examine every discipline required for building and sustaining online success. Bonus: Click here to receive a free subscription to Website Magazine.